Walking around my neighborhood in Boyle Heights, on the eastside of Los Angeles, I see murals and street art conveying pride in the community and the cultural roots of its residents. I see street vendors and informal entrepreneurs trying to capture the America dream; and I smell delicious food and hear infectious Latin music that will make you want to move with the rhythm. What I don't see are solar panels, plentiful shade trees and green space, electric vehicles, and other icons of the growing clean energy economy. Instead, I smell vehicle exhaust and feel the heat trapped in my neighborhood and many like it on the eastside, where communities are bisected by freeways, surrounded by toxic facilities, and bound by a jungle of concrete. But it doesn't have to be like this. Recently a coalition of labor, environmental justice, and community organizations teamed up with Environmental Defense Fund (EDF) to put together Eastside Sol, the first 100 percent solar powered art and music festival on the eastside of Los Angeles. The goal of the event was to create a vision of what the community might look like with abundant solar power, more trees and greenspace, and a fair share of the growing clean energy economy. But there was a twist: We also wanted to create a space that reflected the rich culture, values, and aesthetics of the community, while engaging residents in a conversation about solar power in a way that was accessible and open to all. Eastside Sol brought out over 350 eastside residents to enjoy a day of art, music, good food, and clean energy! 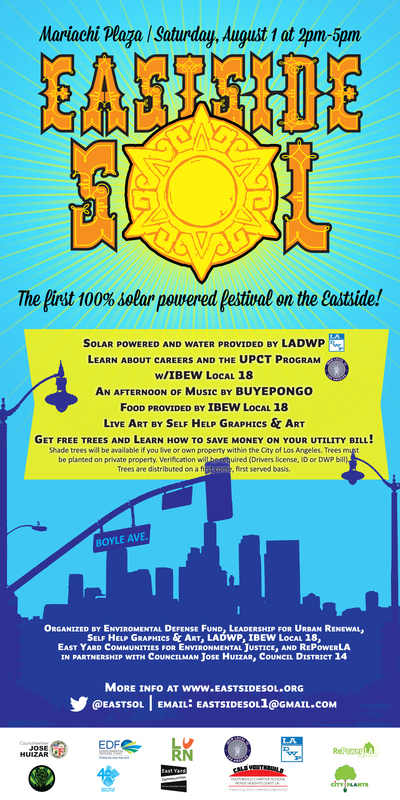 While Eastside Sol was a fun and lighthearted event, there are more serious imperatives underlying this celebration, which expose a critical need for increased access to solar power and other clean energy resources in Boyle Heights and similar L.A. communities. Climate change is already impacting the Los Angeles area with higher than normal temperatures, and bringing higher energy demand along with it. The city broke its all-time record for energy demand last year on a particularly hot day, with nearly double the peak energy demand experienced on a typical day in the city. Record-breaking heatwaves are expected to increase, both in frequency and intensity in the coming decades; some regions of Los Angeles will experience triple or quadruple the number of "extreme heat" days (temperatures 95 degrees and above). Solar can help people save money on their energy bills, especially during heatwaves, but many residents face significant barriers to accessing this abundant and clean form of energy. In my neighborhood, over 75 percent of residents are renters, and cannot install solar on roofs they don't own. Many who do own their home can't afford to purchase their own solar system (the median income is just over $33,000) or qualify for traditional financing. And while Los Angeles has been a national leader in solar power, installing more solar than any city in the country, thus far the benefits of solar have been concentrated in the city's wealthiest neighborhoods. New research by our partners at the REPOWER L.A. coalition found that predominantly low-income and minority communities like Boyle Heights receive between one and three percent of all residential solar panel rebates. Residents in the wealthiest communities receive 31 times the amount of incentives as residents in the poorest communities in Los Angeles. EDF is working with the REPOWER L.A. coalition and many other fantastic community partners to change this by advocating for community solar and other programs directed at helping low income households and renters harness the power of the sun to save money, reduce pollution, and create local jobs. We are committed to this work because we believe that all Californians, no matter what neighborhood they live in, should have the opportunity to participate in and receive the benefits of clean, renewable power.